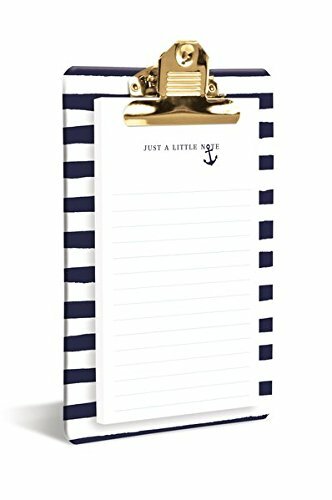 Graphique Navy Anchor Clipboard, Highly-Durable and Sturdy Re-Useable Charming Blue & White Striped Board, Includes Matching 80 Page"Just A Little Note" Pad, 6" x 10" x 0.75"
A decorative desk accessory that will keep your scattered papers and receipts neat and clipped together all in one place! Complete with a matching 80 sheet notepad, dress up your space with our Navy Anchor Clipboard that will allow you to get down to business in style! Makes a great gift for teachers and coaches too! Dimensions: 6"x 10" x .75"
If you have any questions about this product by Graphique, contact us by completing and submitting the form below. If you are looking for a specif part number, please include it with your message.